For an overview of everything that happened this week, check out the Mayor’s Week in Review Blog. This bylaw is ready for three readings after the public hearing has been held and its purpose is to change the terminology for height regulations in the zoning bylaw. Specifically it’ll remove “storeys” as a definition for maximum height. This bylaw increases the maximum height in all affected zones from 14 metres to 16 metres in response to advances in building construction methods. “For example, the (RA7) Low Rise Apartment Zone allows a four storey building in 14 metres, but it is not possible to fit a four storey building within this allowance using standard grade calculation methods and typical building designs.” The bylaw also clarifies when a wind study or sun shadow study should be requested, and adds basic evaluation criteria for both. This bylaw is ready for first and second reading only, which means it’ll be back to Council at least one more time. 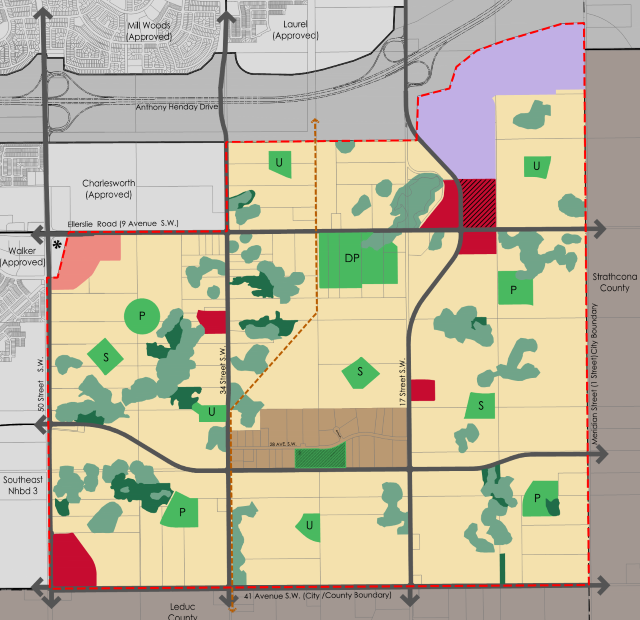 It deals with the Area Structure Plan (ASP) for the area known as Decoteau, which is south of Anthony Henday Drive, east of 50 Street SW, west of Meridian Street SW, and north of 41 Avenue SW. Really far in the southeast, basically. That was developed by a stakeholder advisory group of land owners, residents, developers, the City, and special interest groups. The area is intended to develop over the next 35-40 years. The ASP discusses revenue and expenditure expectations over a 50 year time span. It’s a projection, based on build-out in approximately 39 years with a total population of 67,816 people. Bylaw 17021 includes an amendment to the Horse Hill ASP that reconfigures some of the proposed elements and would result in an increase in the net residential density from 31 to 33.4 units per net residential hectare. Bylaw 17022 is the Neighbourhood Structure Plan (NSP) for the proposed Horse Hill Neighbourhood 2, which is bounded by 195 Avenue NW to the north, the North Saskatchewan River to the east, Horsehills Creek to the south, and Manning Drive to the west. The NSP will accommodate 25,800 people in approximately 10,800 dwelling units, resulting in a density of 38.1 units per net residential hectare. Bylaw 17030 is being considered along those two, and amends the boundary of the North Saskatchewan River Valley ARP. Bylaw 17040 and Bylaw 17041 together proposed to amend the Oliver ARP to allow for the development of medium to high rise mixed-use development on the north side of Jasper Avenue between 121 Street and 122 Street. Currently on that site is the 121 Jasper Liquor Store, Planet Organic, and some empty lots. The second bylaw would rezone from DC1 and CB1 to CB3 which would allow for mixed-use developments up to 14 storeys in height. One report recommends that the City of Edmonton participate in the Sturgeon River Watershed Alliance Steering Committee, with Councillor Gibbons as the representative and Councillor Knack as his alternate. Another recommends that a facilitated session on Edmonton’s Community Energy Transition Strategy be held on March 18. The risk management strategy is “designed to protect Edmonton’s quality-of-life from climate and energy-related risks. The facilitated session would bring Council up-to-speed on the strategy and seek their direction on next steps. 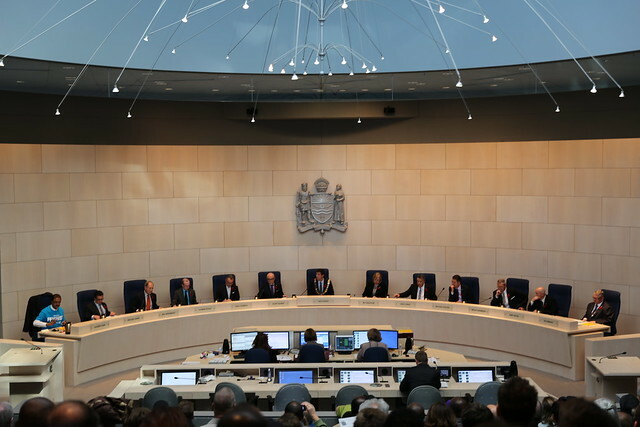 The third report recommends that Councillor Oshry be appointed to the Edmonton Police Commission for the rest of the Council term. Six of the other bylaws are to undertake, construct, and finance various Waste Management projects. That the Mayor write to the Premier and Minister of Education to express Youth Council’s opposition to Bill 10 in its current form. That the grant recommendations for the Cultural Diversity in the Arts program be approved. That the Festival Seed Operating Grants be approved. That the grant recommendations in the Edmonton Heritage Council report on Operational, Project, Seed Project, and Travel Grants be approved. That the Community Services report on the Civic Precinct Master Plan be received for information. That the St. Josaphat Cathedral be designated a Municipal Historic Resource and that funding of up to $500,000 for the project be approved. That the McKay Avenue School be designated a Municipal Historic Resource and that funding of up to $300,000 for the project be approved. That the City proceed with the startup strategy outlined to establish a municipally owned and controlled for-profit land corporation to focus on City-building initiatives in addition to earning profits. That the Transportation Committee report on SE LRT integration with the Civic Precinct Master Plan be received for information.